The bill aims to ease bureaucracy, support migrant integration and speed up deportations, among other measures. But it was not without controversy on the left, right and within Emmanuel Macron's governing LREM party. 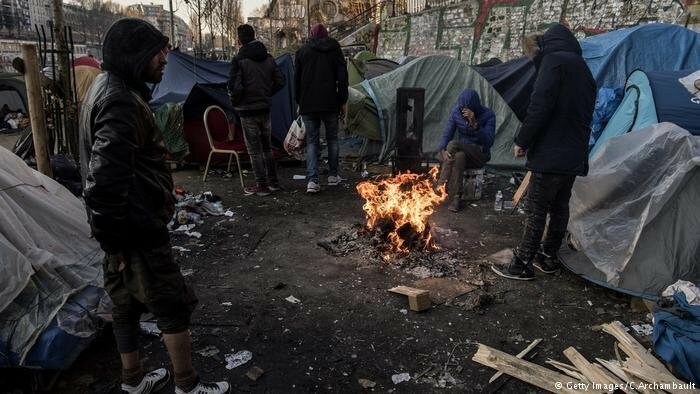 France's lower house of parliament late Sunday approved a major immigration law designed to speed up deportations while promoting better integration and faster processing of asylum applications. After 61 hours of contentious debate, the measure was approved by the National Assembly 228 in favor, 139 against and 24 abstentions. It passed largely with the support of President Emmanuel Macron's Republic On The Move (LREM) party, while leftist and right-wing parties voted against. Richard Ferrand, the head of the LREM group in the assembly, said the law proved "our determination to regulate migration, to promote effective integration, to guarantee the right to asylum, in line with the commitments made by the president of the republic." "When we strengthen the effectiveness of how we regulate immigration, we are not being inhuman, nor anti-freedom, nor lax," he said. But the bill, which must still passed by the Senate, opened divisions within LREM, with one party deputy named Jean-Michel Clement resigning in protest after casting a "no" vote and 14 others abstaining. One controversial part of the bill would increase the maximum time migrants can be held in detention pending deportation from 45 days to 90 days. Lawmakers on the left criticized the increased detention time, while the right-wing politicians wanted it increased to 180 days. Left-wing opponents opposed provisions allowing minors to be held in detention. Interior Minister Gerard Collomb said bill aims for "better controlled" immigration, while making it easier to deport "economic" migrants. The bill also plans to ease bureaucracy by halving the time to six months it takes to process asylum requests. It would also cut in half to 90 days the time asylum seekers have to apply and reduces to two weeks the time allowed to appeal against decisions. Pro-immigrant NGOs said the changes would not provide enough time for applicants to put forward more evidence to support their applications. Supporters of the bill argue that bill promotes integration by promising accepted asylum seekers better access to work and housing opportunities as well as French lessons. The measure would also facilitate family reunification of accepted asylum seekers.